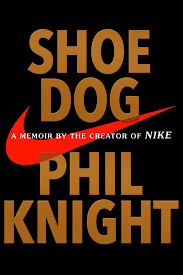 Shoe Dog by Phil Knight was an excellent memoir from the Nike creator, who served as CEO from 1964-2004, Board Chairman through 2016, and then Chairman Emeritus of the company. In addition to being a compelling story of business success, the book was really well written and in the acknowledgements, Knight thanked author J.R. Moehringer and noted relying on his storytelling gifts through drafts of the book. Learning of Moehringer’s involvement felt to make complete sense for me as I saw throughout how good the writing was, and Moehringer wrote along with tennis great Andre Agassi perhaps my favorite sports biography, Open. Part One of Shoe Dog began after Knight’s graduation at twenty-four from Stanford Business School, with him embarking on what wound up being a solo backpacking trip through Asia, Europe, and Africa. Additionally, he went to Japan to try to start a business importing running shoes, based off a research paper written in an MBA entrepreneurship class. Knight visited the Japanese company Onitsuka, maker of Tiger shoes, convinced them he had an importing company called Blue Ribbon Sports, and placed an order for $50 in shoes. Knight then continued on with his journey around the world, from which he seemed to gain a great deal, and wrote in Shoe Dog of how he early on knew he wanted his work to be play, something where he could hopefully feel what athletes feel while competing. After returning to Oregon from his trip, Knight was counseled by a friend of his father to get his CPA so that he'd have "a floor under his earnings," enrolled in three classes at Portland State and nine credit hours later took a job at an accounting firm. Knight noted that while later staffing his own company, he tended to hire a number of accountants and lawyers, both for the thinking skills they had acquired and that they showed they could pass a difficult test. The shoes from Onitsuka arrived in December 1964 and Knight sent a couple of pairs to the track coach from his Oregon undergrad days, Bill Bowerman, who went in with him on the business, 49% to Knight's 51%. Knight placed a large order with Onitsuka and then quit his job at the accounting firm to sell shoes out of his car and hired Jeff Johnson as his first sales rep for Blue Ribbon. While the company was growing fast, cash on hand was always a problem and Knight took a job with another accounting firm, Price Waterhouse, with this one requiring less hours so he could continue growing Blue Ribbon at the same time. Additionally, he in this role met Del Hayes, who would work for Knight for years, and got experience learning what caused some companies to succeed, and others to fail. It was also interesting to read of how Knight spent so much time in a traditional job, while still growing his company outside of that. Blue Ribbon continued expanding and to free up more time, Knight left the firm for a job at Portland State, teaching accounting and it's maxim of assets equals liabilities plus equity, a principle Knight was often up against. One quote about business that stuck with Knight was "don't tell people how to do things, tell them what to do and let them surprise you with their results," and also of note from Shoe Dog was how many different times the company could have gone under, and still made it through. There were various inflection points and Knight battled in business like it was a race, one taking every ounce from him. As Blue Ribbon continued to grow, it made a deal with a Japanese trading company, Nissho Iwai, and while Onitsuka was considering dropping Blue Ribbon as it's U.S. distributor, Knight made a football shoe in a factory in Mexico, and under the name Nike. A legal battle later ensued with Onitsuka and while it was settled in 1974, Nike battled supply and demand issues with the new waffle trainer shoe a huge hit. Then in 1975 the company had a cash crunch and lost it's local banking partner, with the relationship with the trading company saving the day and keeping them in business as Nissho paid the Oregon bank in full. Then after getting past this hurdle, Nike received a letter from the U.S. Customs Service saying they owed $25M in retroactive import duties, as the result of orchestration by competitors. A lengthy back and back with the government ensued and after a settlement of $9M was reached, Nike was able to continue forward, with going public at least in part to finally get past it's constant cash flow issues. The ending of Shoe Dog is heavily about Knight's sons, including his first born Matthew, who as an adult died in a scuba diving accident, and the final chapter beautifully written and really brought everything together as a poignant and compelling read.